Much like all things in life, these battery-powered teeth scrubbers also have a history. It is not as glorious as the Trojan War, or the history of Apple, for instance, but it is filled with historical facts nevertheless. Terminology, such as plaque and gingivitis are considered modern. However, as long as humans have existed, there has been a need for teeth cleaning. Whether it has been done for oral health purposes, or simply to remove a stubborn piece of corn stuck between the teeth, brushing has been around for thousands of years. 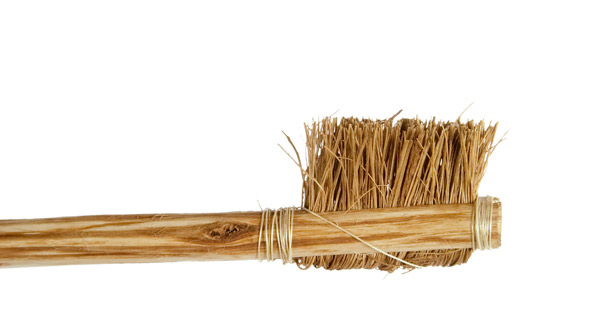 First tools to resemble a toothbrush were simple wooden sticks with a frayed end. Such “technological advances” were first evident as far back as 3000 BC, in the era of the Babylonians and ancient Egyptians. Interestingly enough, toot-sticks have been found buried in tombs of rich Egyptians. Indicating that tooth care is an ancient concern. Moving away from the primitive brushing sticks, to the primitive chewing sticks. Around 1600 BC the Chinese invented what can be considered the equivalent of a chewing gum, a chewing stick. It was more designed to freshen the breath, rather than to clean the teeth. It was made with aromatic tree twigs, and it was likely designed while Chinese were on break from building the Great Wall. The closest resemblance of a modern toothbrush was built around 700 AD by the Tang Dynasty in China. It was not the Tang Dynasty that sat there inventing a method to brush their teeth, it simply occurred during the years of their rule. The handle of the brush was made from bamboo, or in some cases animal bone and it was around 5 inches long. The head of the brush, where we are used to having bristle, was formed of hog hairs. Whether it was pig, warthog, groundhog, or hedgehog, I cannot say. It just makes me question the ancient levels of hygiene all over again! It was not until 17th century that the word “toothbrush” entered the English dictionary. Reportedly, it was first used by an English gentleman by the name of Anthony Wood. The word was used in his autobiography when he was describing his daily habits. 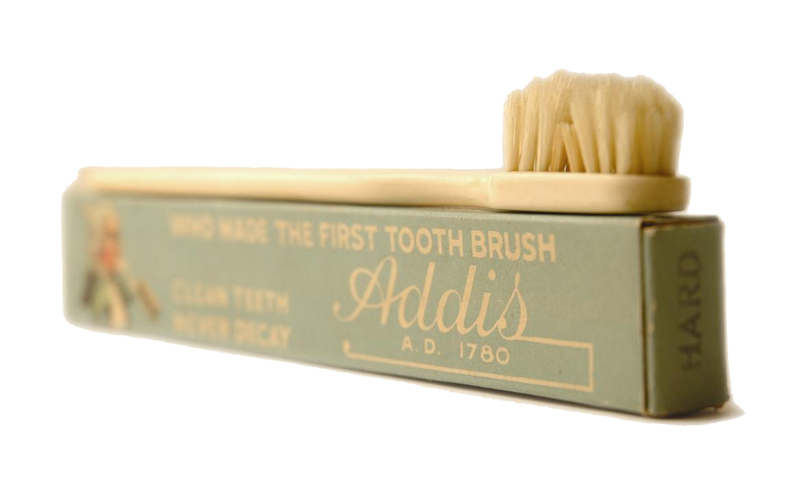 The first toothbrush produced on a mass scale did not come to life until the early 1780s. More modern, for its time, the design was made by another Englishman, named William Addis. The handle of the brush was made from cattle bone, while the head from swine bristles, horse hair, or feathers. So, it took over 2000 years to basically remake what the Chinese already had and put it in mass production. In short, this is how the toothbrush was introduced to the systems of capitalism. The concept of brushing teeth quickly gained popularity. By 1840, consumer demand forced Addis to expand his business and begin to automate the manufacturing process. It was also around that time that the first 3-row bristle toothbrush was invented. By the year 1869, Addis’ company was able to completely outsource the manufacturing of brushes to machines. 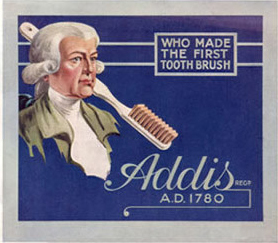 The demand and supply of toothbrushes by Addis continued through the years to come. The company supplied troops in World War I and World War II with the means to brush their teeth. In fact, Addis was producing close to 1.8 million units per year by the end of 1926. As the Industrial Revolution was catching up, so was the demand for new technological advances that could make life better. The standard of living was raised, and so were people’s demands for health products. What is often considered as the first electric toothbrush, was not really an electric device. It was a 1800s invention by Dr. Scott that was advertised as being powered by electricity, when in fact it was not. Instead, there were iron rods inside the handle. Needless to say, this prototype did not catch up. Moving away from Dr. Scott’s creative advertisement towards the real deal. Widely known as the Broxodent, the first motor-powered toothbrush was invented by Dr. Philippe Guy Woog in Switzerland. 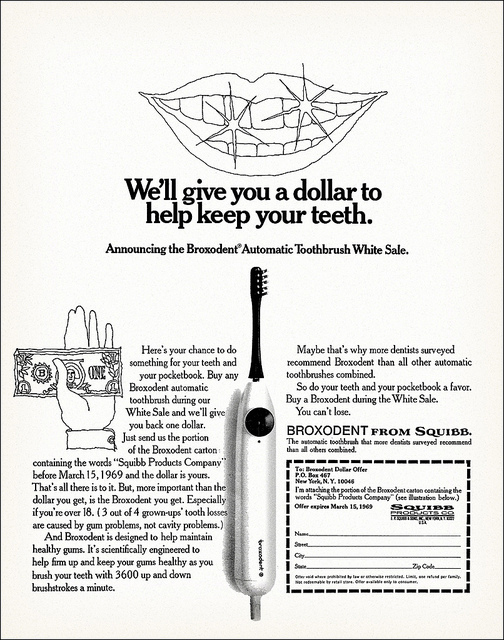 It was not until 1959 that the Broxodent, renamed to the Broxo Electric Toothbrush, was finally introduced to the United States. The product was distributed by E. R. Squibb and Sons Pharmaceuticals who later on changed the name again, this time to Broxo-Dent. This model was electric, alright, but it was not cordless or rechargeable. As such, it connected straight to a wall outlet and ran on live voltage. Not something any dentist would recommend in contemporary days. Perhaps, this is why the sales of the unit plummeted rather quickly and this particular model did not gain much consumer popularity. It was General Electric (GE) who first managed to improve the concept of the motor powered brush. 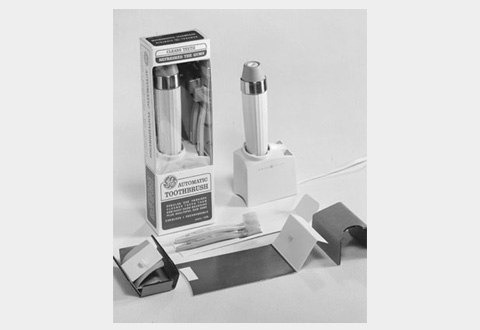 They did so by introducing the first rechargeable and cordless toothbrush to the market in 1961. You no longer had to be attached to the electrical outlet and calmly wait to be electrocuted. Despite its improvements, the GE model did not come without problems. Because battery innovation was in its early stages, the company used NiCad batteries. However, their life was short and they had to be discarded shortly after usage due to the sealed unit design of the toothbrush. General Electric got one thing right though, and that was the charging stand. They designed it in a way so the toothbrush can stand upright. This may not seem like a considerable thing, however, modern-day manufacturers still use the same design. 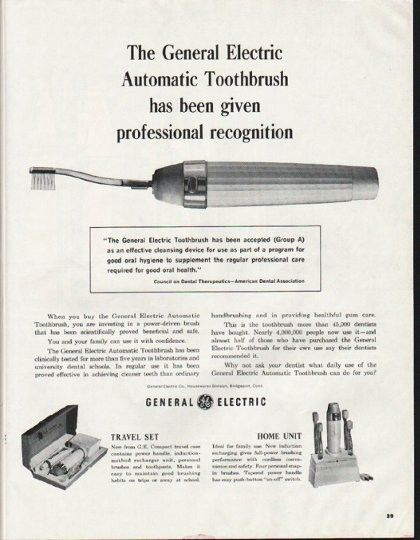 New safety and technology regulations further helped shape the electric toothbrush. In the early 1990s lower voltages (12, 16 and 24) were introduced for bathrooms. As such, electric devices had to be modified in order to conform. Broxo is still alive to this day. However, giant corporations such as Philips and Oral-B have taken the toothbrush market by storm, living very little space for Broxo.